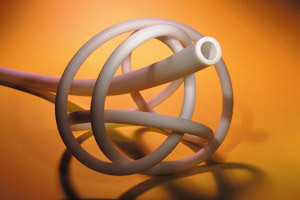 PharmaPure® is a premium, low spallation, biologically compatible peristaltic pump tubing developed especially for pharmaceutical, biotechnology, and laboratory applications. This tubing meets the demanding challenges of providing unsurpassed pump life, with ultra-low particulate spallation and very low permeability. PharmaPure®'s superior flex life characteristics simplifies the manufacturing process by reducing production downtime due to pump tubing failures. PharmaPure® has low permeability and is ideal for protecting sensitive cell cultures, fermentation, separation, purification, process monitoring, and sterile filling. PharmaPure® is a registered trademark of Saint-Gobain Performance Plastics.